How many hours do we scroll every single day? A big question right! Yes, I would love to call this a scroll age. Every single day we spend hours scrolling up and down on our mobiles. Looking at the statistics of people spending time on social media, it’s for sure that brands which fail to market themselves using this method are missing out a great way of creating their presence in a place where their audiences are actively hanging out. Statistics reveal that there are several businesses working merely on marketing and branding through social media. How about knowing who is doing its best? I have tried to bring together some of the best digital media campaigns which have graced our screens this year. Having an extremely brilliant Twitter handling team, which has taken ‘pun-of course intended’ to a whole new level. Long story short, KFC Quietly Followed 11 Herbs and Spices on Twitter. Their Twitter handle, with about 1.23 million followers the last we checked, happens to follow just 11 Twitter users. Then Waited to See If Anyone Would Notice. Chains secret recipe is made up of 11 herbs and spices. And these are the five Spice Girls and six men named Herb. Twitter user @edgette22 noticed what was going on with KFC’s Twitter follows and his tweet soon went viral. Many Twitter users took this as an opportunity to take out their Sherlock Holmes pipes and wonder (tweet) out loud how this was also a clever giveaway by KFC. Wrapping up the year 2017 and taking the rise of smartphones into consideration Spotify headed up with one of the biggest marketing campaigns of the year which included out of home (OOH) marketing and digital featuring world famous artists. The campaign included a series of awesome fake movie trailers with some inspiring music choices and another round of witty out-of-home marketing. This campaign focused on the customer data seized from user playlists and streaming habits. All these data were printed out in a storytelling format and pasted on billboards around the country. The brand was taken to the streets giving it a sort of hyper-locality. This campaign helped Spotify to bridge the gap between digital and online giving the brand a local feel. The billboards were shared by artists with their selfies and hence there was a tremendous spike in the sharing and the traffic and the engagement with that artist’s page. Adidas the international athletic brand took a step forward with a fresh and pioneering digital marketing approach. Their strategy was based on the utilization of 30000 runners of the Boston Marathon to create personalized videos of the participants and promote its latest running apparel. The blend of emerging technologies and the user-generated professionally produced content made this campaign a host of rich and visual content. This sprinkled a real-life glimpse into the buzz of the event, the reward of the challenge and exclusive metrics showcasing each participant’s progress during their run. This campaign proved to be emotional, immersive and personal digital marketing campaign as it did head turning, which resulted in a collective of 100000 video views in the first two days. An offbeat creativity can sometimes translate to maximum success and publicity. This was demonstrated by IHOP (American pancake chain) and its marketing strategy. Recently, The International House of Pancakes (IHOP) announced its official name change on Twitter, asserting that it would be rebranding itself as IHOb. This sudden announcement picked up a momentum instantly with Twitter users speculating as to what the “B” will stand for. ‘b’ stood for burgers and was also an ingenious way to focus on the aesthetic of ‘flipping a pancake’ by flipping a letter upside down. Because of this mass social media attention, IHOP saw a huge increase in social media mentions in only one day, boosting awareness of the brand altogether. 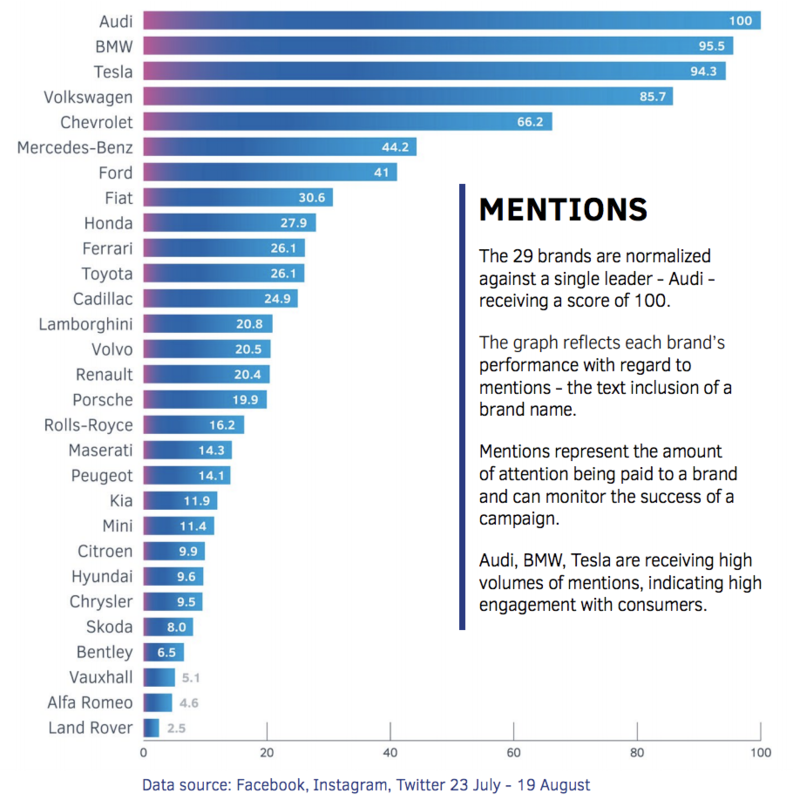 Tesla and its social media success are utmost impressive than most of the well-known brands including BMW, Audi, and Chevrolet as they rank among the top 3 most mentioned brands on Twitter. Their Twitter engagement numbers represent every like, retweet, impression, mention, and reply completely crush the competition. This holistic level of success is grabbed just by tweeting as little as 4 times a month. We can identify two key elements behind this success. 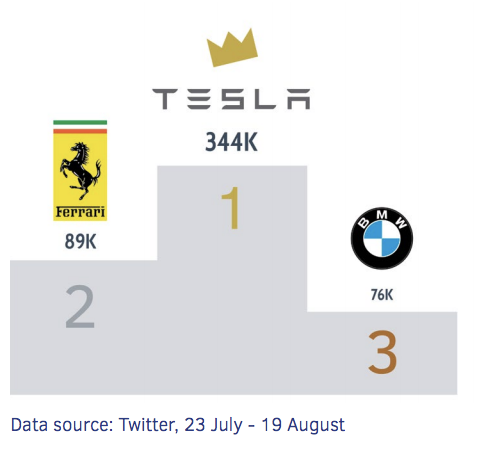 One is the popularity of the Tesla’s CEO Elon Musk, the world’s foremost tech superhero extremely active on Twitter having over 20.7 million followers. The second element being the use of live stream events which draws tons of hype and attention with viewers sharing the links on social media platforms and live-tweeting. Procter and Gamble stopped people in their tracks with their haunting real-life glimpses into the struggles which are faced by today’s youngsters who are growing up black in the United States. In a two-minute short titled video named “The Talk”, P & G shows young African Americans talking to their parents based on their real-life scenarios displaying a hard-hitting reality rather than making any statements. The way this video is produced is spectacular. Taking a stab at a reality where each voice and opportunity is equivalent, P&G opened the transformation about the inclination towards the black community in America – and this video alone has earned more than two million views on YouTube. This campaign validates that to convey the ethos of a business and have an honest to impact, you ought to dependably be straightforward and never be hesitant to be bold. Beauty stereotypes are seeded into our life from childhood. This insight was tapped by Dove to establish a strong presence with the #changetherhyme campaign. Their aim was to activate the real beauty in India using the local insights. The campaign celebrated the beauty of a different kind featuring Indian women athletes training to the soundtrack of our most favorite all-time rhyme ‘Chubby Cheeks’. Dove fueled a conversation about the unrealistic standards of beauty that society hands down to impressionable young girls. Brand fetched millions of YouTube views from reams of user engagement. The provocative creative and how it questions the rules of beauty is brilliant. Here the message comes across as powerful and breaks the notion of how a woman should be. Furthermore, the insight of questioning and initiating a dialogue on why these ‘rhymes’ and who created them steals the show. China is the most populous country and it is believed that as time passes the country will dominate the most prevalent sport that’s Football. Nike with its new humorous campaign named ‘Dare to Become” focuses young Chinese footballers unlocking their potential to dominate the world of football. This campaign aimed at leveraging the huge public interest in football in China depicting a future where the world’s greatest football players are Chinese. Customer experience has become the most important factor for digital transformation, and 2018 will be more about personalized engagement. There are many more exciting campaigns carried out by big brands. Hope you all loved my picks?